What is leave application form? 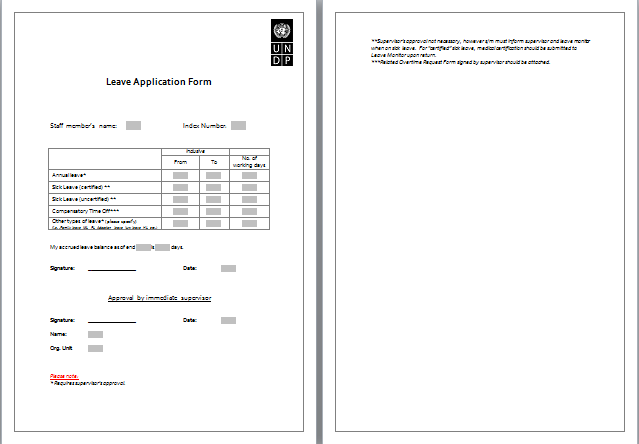 One of the common and widely used documents in all organizational and institutional setups is the leave application form. Whether it is a business entity, a government organization, non-profit company, educational institution or any other form of organizational setup, leave application forms are present in its standard operating procedures. All the employees and workers in an entity are required to fill in the form and submit it to the relevant authority for the approval of their required leaves from work or office. Different organizations have drafted different procedures that are carried out to seek this approval. But in most cases, the leave approval process starts from the filing of the leave application form. The leave application form requires the applicant to provide certain important details about his personal data like name address, contact information, department of service, employee registration number and other such credentials. Along with this, there is also the requirement to provide a valid reason for the absence of work or job and the past record of leaves availed by the employee. In many cases, the applicant may also be required to provide a medical certificate or any other valid formal document that can support his reason for seeking a leave from office. A leave application form can be a generalized document or in more sophisticated environments it may be classified into the types of leaves like medical leave, study leaves, casual leave, paid leave and much more. Hence anyone working in an office or organization must know when and how to utilize this form.